Edgardo Antonio Alfonzo a.k.a. "Fonzie" (born November 8, 1973) is a former Major League Baseball infielder who is currently a coach for the Brooklyn Cyclones. He bats and throws right-handed, and is 5 feet 11 inches (1.80 m) tall and weighs 187 pounds (85 kg). Alfonzo has worn the number 13 since his Major League debut, however switched to the number 12 in March 2005 giving former teammate, and former San Francisco Giants shortstop, Omar Vizquel the number 13 to honor not only the longevity of Vizquel wearing the number, but also because the wearing the number 13 is a term of respect and honor to Alfonzo and Vizquel's fellow countryman Dave Concepción (all three from Venezuela). Alfonzo also wore the number 13 through some of his career with the New York Mets. Alfonzo was signed by the Mets as an undrafted free agent in 1991. That year he joined the Gulf Coast League Mets. The following season Alfonzo moved up and split time with the short season "A" Pittsfield Mets of the New York–Penn League and Class "A" Florida State League St. Lucie Mets in 1992. Alfonzo returned to St. Lucie the next season and played for them in 1993. In 1994, he was promoted to the Binghamton Mets of the Class "AA" Eastern League, and led the team in home runs and RBI. Alfonzo made his Major League debut on April 26, 1995. At the beginning, he was a semi-regular fielder, splitting time at second base, shortstop, and third base with several others. During his rookie season, Alfonzo spent most of his time at third base while accumulating a .310 batting average after the mid-season break. In 1997 and 1998, he started regularly on third. After the 1998 season, the Mets signed third baseman Robin Ventura, and Alfonzo was forced to move to second base. While he was upset about the move at first, he became one of the best defensive second baseman in the league from 1999–2001. Alfonzo was part of the infield considered to be among the best infields in MLB history on a cover of Sports Illustrated, along with Rey Ordóñez, Robin Ventura, and John Olerud. Before the 2002 season, the Mets signed the aging Roberto Alomar, and despite Alfonzo's tremendous offensive and defensive contributions during the previous three seasons, he was forced to move back to third base. He remained strong defensively; however, he struggled on offense, and the Mets decided not to re-sign him. 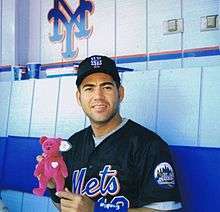 Alfonzo had his first opportunity to display his clutch hitting ability to a nationwide audience in the 1999 playoffs. After finishing in a tie with the Cincinnati Reds for the National League Wild Card, the Mets played a one-game playoff to decide who would go on to the division series. In his first at bat of the game, Alfonzo homered over the center field fence, providing the Mets with all the offense they would need as Al Leiter threw a complete game shutout. On the very next night, the Mets played the Arizona Diamondbacks in the first game of the Division Series. Facing the feared Randy Johnson, Alfonzo again homered in his first at bat of the game, this time launching a two-run shot to center field. In the ninth inning of the same game, with the score deadlocked at 4–4 Alfonzo launched a grand slam down the left field line to help seal the victory for the Mets. In 2000, playing against the San Francisco Giants in the Division Series, Alfonzo hit a two-run homer in the ninth inning of game two, which would prove to be of immense importance as J. T. Snow launched a three-run homer in the bottom half of the inning to tie the game. The Mets would eventually win the game 5–4 in ten innings. In game three of the series with the Mets trailing 2–1 in the bottom of the eighth inning, the Giants brought in their dominant closer Robb Nen, who had not blown a save since the All-Star break. Alfonzo responded by lining a ball down the left field line for a double to drive in Lenny Harris. Benny Agbayani would later homer in the thirteenth inning to win the game for New York. Alfonzo then batted .444 against the Cardinals in the NLCS. He hit .143 in the World Series against the New York Yankees. Alfonzo's knack for getting the big hit in the clutch spot had endeared him to many Met fans who still consider him one of the all-time Met greats. Coming off two excellent seasons in which he batted .304 and .324, Alfonzo had every reason to expect a big year in 2001. He had his best power numbers in 1999 (27 home runs, 108 RBI, 41 doubles) and 2000 (25, 94, 40), and at 27, he was at an age in which many hitters have their best season. However, Alfonzo suffered from a variety of injuries, including sore right hand, knee, thigh and a back injury from years before, costing him playing time and lowering his stats to .243, 17 HR, 49 RBI. He finished 2002 with .308, 16, 56, and signed with the San Francisco Giants as a free agent in the off-season. In 2003, Alfonzo struggled for most of the first half for the Giants. He was hitting .216 with 27 RBI at mid-season, but he hit .306 with 54 RBI the rest of the way, and performed well against the Florida Marlins in the NLDS, when he hit .529 (9-for-17) with five RBI. He had the lowest range factor among Major League third basemen (2.46). Alfonzo enjoyed a slight career renaissance in 2004 hitting for his career average, although with reduced power numbers. But his career continued its downward trend in 2005 due to age, nagging injuries, and reduced playing time in favor of Pedro Feliz. He was acquired for Steve Finley As a member of the Los Angeles Angels of Anaheim, Alfonzo's playing time further decreased in favor of younger players. After hitting .100 for the season in late May, the Angels released Alfonzo, whose agent had gone public in demands for a trade for lack of playing time, on May 20. On May 26, 2006, Edgardo signed a minor league contract with the Toronto Blue Jays and was soon called up to Toronto to help the Jays' injury and error-riddled middle infield. He was released on June 12, after appearing in only 12 games for Toronto. In July 2006, Alfonzo signed a contract with the Bridgeport Bluefish of the independent Atlantic League of Professional Baseball. After appearing in a small number of games with the Bluefish, Alfonzo's contract was purchased by the Mets on July 15. Alfonzo reported to the then-Mets Triple-A affiliate Norfolk Tides with hopes of making it back to New York. In February 2007, Alfonzo returned to the ALPB, signing with the Long Island Ducks. On December 14, 2007, Alfonzo signed a minor league contract with an invitation to spring training with the Texas Rangers. After getting reassigned to minor league camp, Alfonzo was released before the season on March 27, 2008 and signed with the Tigres de Quintana Roo in Liga Mexicana de Beisbol. 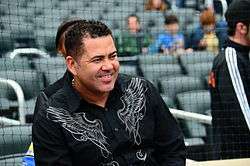 On June 9, 2008, Alfonzo signed with the Long Island Ducks. In February 2009, Alfonzo signed a one-year contract with the Yomiuri Giants of Japan's Central League. He was released by the Giants on December 2, 2009. In 2010 Alfonzo signed a contract with the Newark Bears, reuniting him with his former Mets teammate Armando Benítez. In 2012, the Chicago White Sox signed Alfonzo and assigned him to the Charlotte Knights. Alfonzo is a coach for the Brooklyn Cyclones. He began in 2014. He originally coached home games and select road games in 2014, before coaching all games in 2015. Finished second in Gold Glove balloting on three occasions; in 1997 as a third baseman, and in 1999 and 2001 at second base. Alfonzo finished third in the voting as a third baseman in 1999 and fourth in 2004 at second base. Currently ranks third in New York Mets franchise history with 1,136 hits and fifth with 538 RBI. Currently ranks third in New York Mets franchise history with 123 runs scored in a single season. This feat was accomplished in the 1999 season. ↑ Wayne Graczyk (December 6, 2009). "Turney breaks ground as first foreign coach in history of Giants". The Japan Times. japantimes.co.jp. Retrieved 2010-01-01.